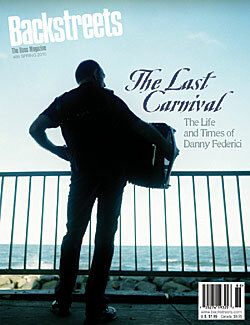 Spring 2010, "The Last Carnival: The Life and Times of Danny Federici." The centerpiece of this issue is our tribute to the late great Phantom Dan, with more than 40 pages dedicated to the Minister of Mystery. Illustrated by renowned photographers including Barbara Pyle, Danny Clinch, and Neal Preston, this section features Chris Phillips's extensive Danny-focused interviews with E Street Band members Garry, Max, Roy, Nils, and Clarence; Robert Santelli on Danny's first band The Story Tellers; Charles R. Cross on "The Last Carnival"; Bruce's Danny stories from the stage; Jason Federici on his father's final performance; and every eulogy from Danny's memorial service -- touching and enlightening speeches from Max, Bruce, Dave Marsh, and more. Plus: An exclusive English translation of Springsteen's 2009 Vanity Fair Italy interview; Magic/WOAD tour wrap-ups including Flynn's picks for best recordings from each; Bruce enters NJ Hall of Fame; Kennedy Center Honors; Working on a Dream releases and collectibles; Magic Tour Highlights EP; Wrecking Ball EP; Clarence Clemons interview and Big Man: Real Life & Tall Tales review; a new "On Collecting" column by Eddy Wehbe; tributes to Madame Marie, Tim Russert, and David Gahr; we track down horn player Steve Paraczky from the E Street Band's lawsuit-era line-up; reviews of the latest CD-Rs and Bruce boots, and more. 100 pages, full-color, perfect bound.